This is a rather special pedal that is somehow both brutal yet refined, like a luxury saloon with a 700hp engine. Exceptional clarity, punch and dynamic range. Addictive 1967-style Plexi drive sounds. The pedal’s voicing is quite bright, but you can tame it with EQ. 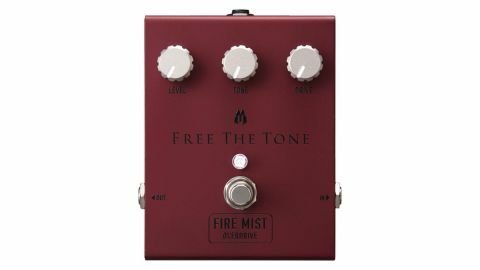 Free The Tone doesn’t do things by halves. Its FM-1V Fire Mist drive, from the company’s new Integrated Series of pedals, weighs a hefty 1.4lbs and packs in some of the most edgy, addictively playable Marshall-inspired tones we’ve encountered. And it says something that this is the first pedal in ages that’s left our fingers raw from playing, just for the sheer joy of it. The outward format of the pedal couldn’t be more simple. There are only three controls, with chunky brass (yes, brass) knobs: Level, Tone and Drive. These work exactly as they do on other drive pedals, so ease of operation is instant and wholly intuitive. Beneath the understated enclosure, however, lies a highly fettled tone engine that is anything but ordinary. Designer Yuki Hayashi has tried to fine-tune nearly every aspect of the design, including the custom-designed enclosure, an ‘IC Tone Plate’ that provides sonically beneficial shielding for an IC chip, plus a so-called Passive Tone Circuit that aims to reduce phase shift for a sound that sits comfortably in any mix. But, so much for the techno-babble. How does it sound plugged in? Well, if this is Marshall inspired, then it’s Marshall with the gloves off. So many pedals that aim to capture the Plexi sound actually focus on the mid-rich compression and bass push of classic Marshalls. The Fire Mist, however, also gives you that headroom and edge, which is so much a part of playing high-wattage Plexis. Played with our reference Jimi Hendrix Stratocaster and Gibson Memphis ES-330 into a Dr Z Jaz 20/40 combo, there’s lots of treble on tap and the pedal has a very faint suggestion of ‘cocked wah’ about its voice, but what a voice it is: wiry, raucous, yet punchy. Think aggressive Manic Depression Jimi tone, not blissed out Little Wing. Unusually, the Fire Mist sounds great with the gain maxed out - normally the extreme of the gain dial’s range gets tizzy on overdrive pedals. Not so here, with the tone remaining composed, clear and nuanced to the last drop of gain, with natural-sounding sustain holding each note aloft. This is a rather special pedal that is somehow both brutal yet refined, like a luxury saloon with a 700hp engine. It’s expensive, yes, and a bit savage - but we just can’t stop playing it.